Vital Records of Medfield, Massachusetts to the Year 1850 (Boston, Mass. : New England Historic Genealogical Society, 1903), Marriages, page 171, Aaron Smith and Mercy Plimpton entry. Aaron Smith (1765-1841), son of Moses and Patience (Hamant) Smith, married Mercy Plimpton (1772-1850), daughter of Amos and Mary (Guild) Plimpton on 6 October 1795. 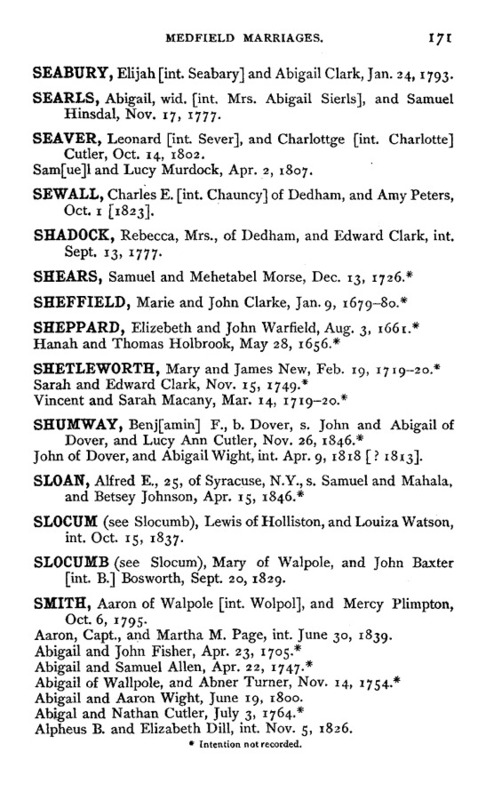 They had 8 children between 1795 and 1815, all registered in the Medfield town records. Aaron and Mercy (Plimpton) Smith are my 4th great-grandparents; I am descended through their 4th child and first son, Alpheus B. Smith (1802-1840), who married Elizabeth Horton Dill (1791-1869) in 1826.